In this article, we will show you how easily you can setup Plex Home Media Server on major Linux distributions with their latest releases. 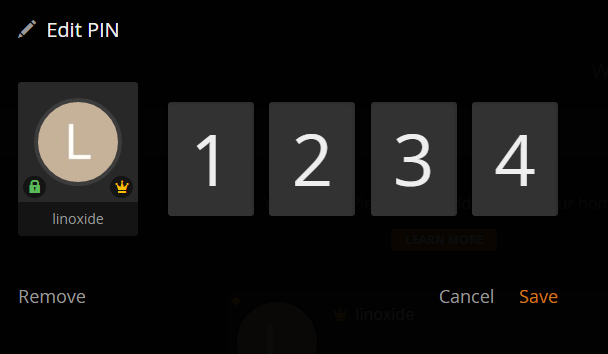 After its successful installation of Plex you will be able to use your centralized home media playback system that streams its media to many Plex player Apps and the Plex Home will allows you to setup your environment by adding your devices and to setup a group of users that all can use Plex Together. So let’s start media server installation first on Centos 7. System resources mainly depend on the type and number of devices that you are planning to connect with the server. So according to our requirements, we will be using as following system resources and software for a standalone server. 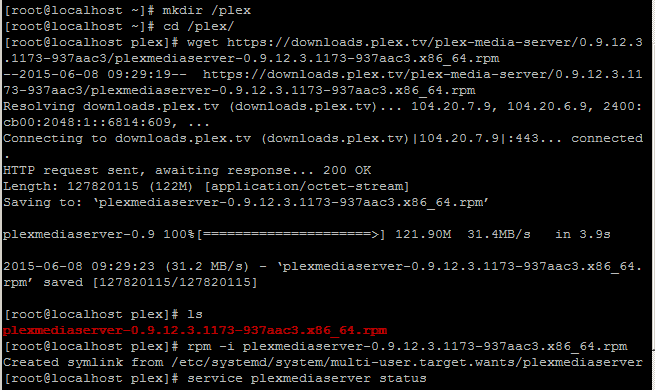 To install Plex Media Server on centOS 7 we need to download the .rpm package from the official website of Plex. So we will use wget command to download .rpm package for this purpose in a new directory. After completion of complete download package we will install this package using rpm command within the same directory where we installed the .rpm package. We have successfully installed Plex Media Server Now we just need to restart its service and then enable it permanently. 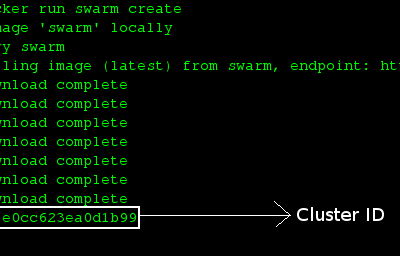 Now we just need to repeat all steps that we performed during the Web app setup of Ubuntu. So let's Open a new window in your web browser and access the Plex Media Server Web app using localhost or IP or your Plex server. 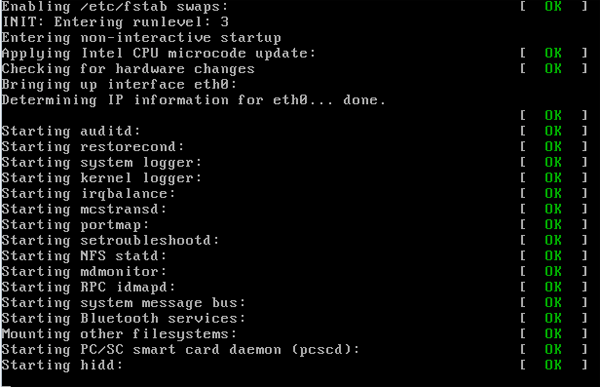 Then to get full permissions on the server you need to repeat the steps to create the SSH-Tunnel. After signing up with new user account we will be able to access its all features and can add new users, add new libraries and setup it per our needs. The Basic steps to download and install Plex Media Server are the same as we did for in CentOS 7.1. We just need to download its .rpm package and then install it with rpm command. We had setup Plex Media Server on the same host so we don't need to setup SSH-Tunnel in this time scenario. 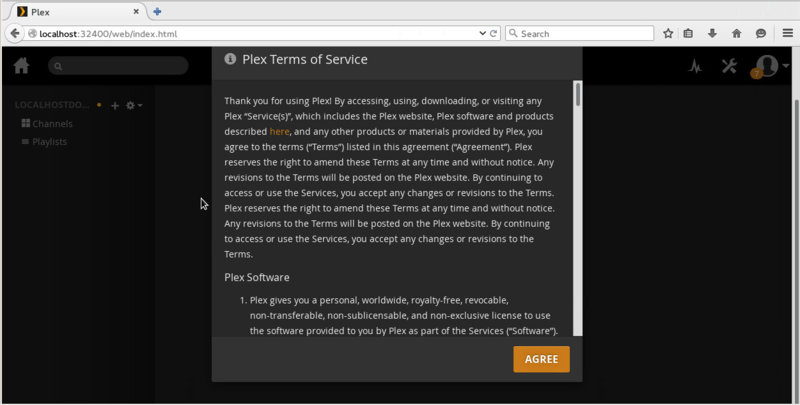 Just open the web browser in your Fedora 22 Workstation with default port 32400 of Plex Home Media Server and accept the Plex Terms of Services Agreement. Lets login with your plex account and start with adding your libraries for your favorite movie channels, create your playlists, add your photos and enjoy with many other features of Plex Home Media Server. We are now ready to start the installations process of Plex Media Server on Ubuntu so let’s start with the following steps to get it ready. Login to your server with root privileges Make your that your system is upto date if not then do by using below command. Create a new directory and download .deb plex Media Package in it from the official website of Plex for Ubuntu using wget command. Now within the same directory run following command to start installation of debian package and then check the status of plekmediaserver. After you have access to the web interface of Plesk Media Server make sure to Sign Up and set your username email ID and Password to login as. 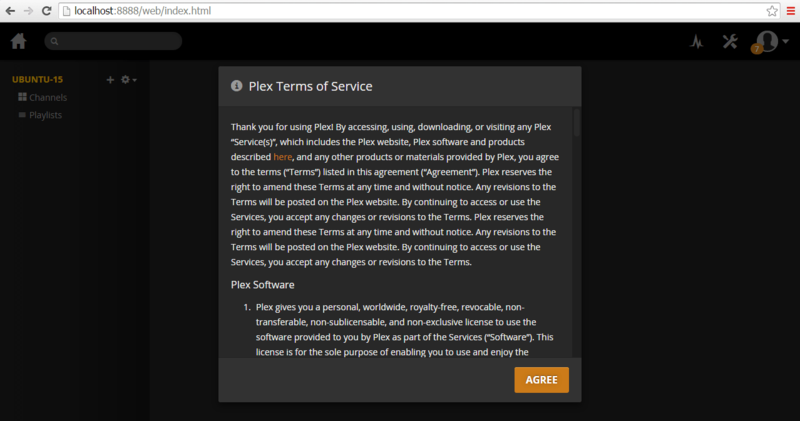 Now you have successfully configured your user under Plex Home Media. As we have seen in our Plex media home page that it indicates that "You do not have permissions to access this server". Its because of we are on a different network than the Server computer. Now we need to resolve this permissions issue so that we can have access to server on the devices other than the hosted server by doing following setup. First, we need to set up a SSH tunnel so that we can access things as if they were local. This is only necessary for the initial setup. If you are using Windows as your local system and server on Linux then we can setup SSH-Tunneling using Putty as shown. Open your Web browser window and type following URL in the address bar. 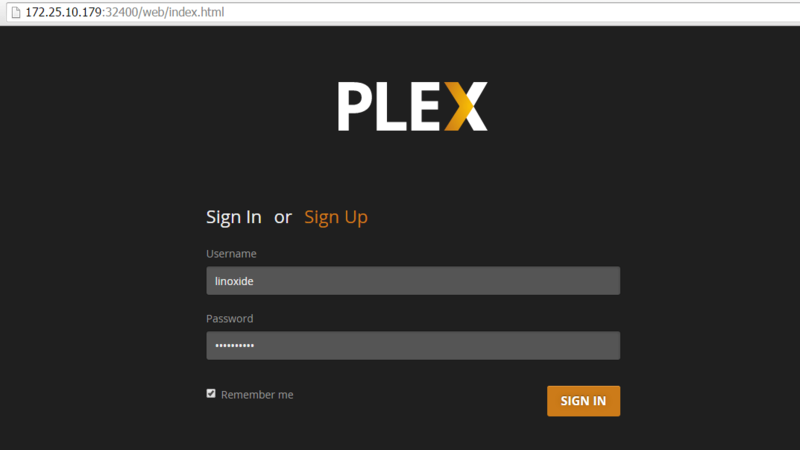 The browser will connect to the server and load the Plex Web App with same functionality as on local. Now a fully functional Plex Home Media Server is ready to add new media libraries, channels, playlists etc. 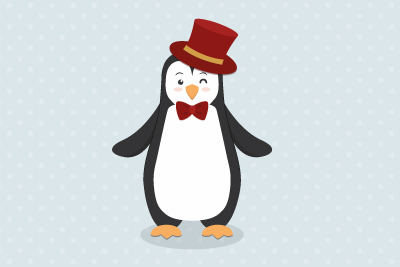 We had successfully installed and configured Plex Media Server on Major Linux Distributions. So, Plex Home Media Server has always been a best choice for media management. Its so simple to setup on cross platform as we did for Ubuntu, CentOS and Fedora. It has simplifies the tasks of organizing your media content and streaming to other computers and devices then to share it with your friends. Linux Systems and Security Engineer in Information and Communication Technology. Results-driven ICT Professional and Open Source Geek with technical specialties in the area of Open Source Operating systems and Applications. Also wanted to say thanks! That SSH tunneling was the key to getting my plex set up on a headless Fedora 24 server. Great guide. Works. Been searching everywhere... I've set up Plex on Ubuntu Server and successfully tested streaming output to various clients. What I cannot seem to do is stream output to the server's own sound card (onboard). The Intel and Realtek pkgs are successfully installed but I cannot find in any Plex (or other) info source on how to direct output to those resources.